Skateboarding originated with surfing culture in California in the late 1950s but soon spread across the country. “Sidewalk surfing” entered national pop culture through popular competitions, films, and even pop songs, like Jan & Dean’s 1964 hit “Sidewalk Surfin’.” The sport flourished in beach communities along the New Jersey coast, including Wildwood, where architectural photographer John Margolies (1940-2016), who focused on novelty and vernacular structures, snapped these boarders using a half-pipe in 1978. By the twenty-first century, South Jersey’s seashore provided skateboarders with several purpose-built parks to practice their sport, including one in Ocean City, constructed in 2015 at a cost of $750,000. John F. Kennedy Plaza, better known as LOVE Park after its iconic 1976 statue by Robert Indiana (1928-2018), attracted both local and visiting skateboarders in the 1980s and ’90s. Designed by city planner Edmund Bacon (1910-2005) and architect Vincent Kling (1916-2013), and completed in 1965, the park included attractive features to skateboarders, like ledges, stairs, and railings. Described as “legendary” and “the greatest skate spot ever made” in skateboarding circles, it served as a favored practice spot for both amateurs and professionals. By the mid-1990s, city officials viewed skateboarders as a nuisance to the public and enacted laws to ban the sport formally in 1994 and again in 2000. The bans aroused the ire of not only skateboarders but also Bacon and Kling. Bacon publicly protested the bans by “skateboarding” across the park in October 2002. Standing in the park, he announced, “I, Edmund M. Bacon. . . in total defiance of Mayor Street and the Council of Philadelphia, hereby exercise my rights as a citizen of the United States and I deliberately skate in my beloved LOVE Park.” He then maneuvered across the park on a skateboard with the help of two assistants. Despite this motion by the park’s creators, the ban continued and the park underwent extensive renovations to remove its skateboarding-friendly features in 2003 and again in 2016. Prior to the 2016 construction, the city lifted the ban for five days, which brought hundreds of boarders to the park to enjoy it one last time, despite snow and frigid February temperatures. (Photograph for The Encyclopedia of Greater Philadelphia). During the 1980s, Philadelphia and its surrounding communities emerged as a mecca for the sport of skateboarding. The region developed more than twenty skate parks, and local professional skateboarders achieved international fame over the next four decades. At the beginning of the twenty-first century, approximately 105,000 of Philadelphia’s 1.5 million residents skateboarded. Despite occasional opposition by city officials to skateboarding in public locations, the sport flourished. Skateboarding began in 1958, when early pioneers of the sport attached roller skates to the bottom of boards. This allowed traditional ocean surfers to “sidewalk surf” in places where there were no waves. The following year, Roller Derby, a company with operations in Illinois and California, began to mass-produce skateboards with metal wheels. Between 1963 and 1968, manufacturers of surfboards, such as Makaha and Hobie, started making better-quality skateboards with clay wheels and trucks. 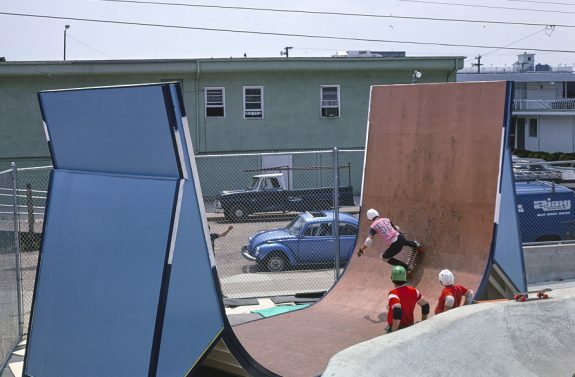 This improved construction and distribution and opened the door for the increased popularity of the sport, prompting the advent of skate contests, the first of which was held in Hermosa Beach, California, in 1963. In the 1970s, skateboards could be purchased at mainstream retailers, such as JCPenney, throughout the United States. Beginning in the 1980s, local skateboarders descended on John F. Kennedy Plaza (Love Park), at Fifteenth Street and John F. Kennedy Boulevard in Center City. This park, designed by city planner Edmund Bacon (1910-2005) and architect Vincent Kling (1916-2013), had opened in 1965 between City Hall and the Benjamin Franklin Parkway. In 1976, the iconic Robert Indiana LOVE sculpture became the park’s most distinctive feature. The park fell into disrepair in the 1980s, but it became a popular spot for local and visiting amateur and professional skateboarders because of its features, such as ledges, railings, stairs, and desirable landing spots. Skateboarders from around the world described the park as “Philadelphia’s skate spot,” “legendary,” and “the greatest skate spot ever.” Popular skateboarders such as Josh Kalis (b. 1976), Stevie Williams (b. 1979), and Kerry Getz (b. 1975) skated in the park as it rose to prominence in skateboarding circles. To the displeasure of skateboarders, city officials formally banned skateboarding on two occasions, in 1994 and 2000. These bans led to conflict between skateboarders and police that often resulted in arrests and hefty fines. The friction sparked a debate between backers of the skateboarders and lawmakers over the rights of individuals and groups to use public space. Ultimately, the debate ended when renovations to the park in 2002 and 2016 resulted in destruction of some of the best spots to skateboard. After city government attempted to end skateboarding in Love Park in 1994, a section of South Philadelphia’s Franklin Delano Roosevelt Park located beneath Interstate 95 was opened to skateboarders. 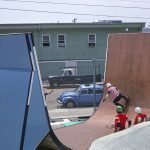 The city contributed sixteen thousand square feet of unused public land beneath the interstate and added skate park features, including pyramids and a grind box for tricks. Local skateboarders created additional features to improve the terrain for better riding and for performing tricks. Over the years, through the efforts of volunteers and international attention caused by competitions and video games, the park evolved into one of the more popular and well-known skateparks in the world. The park hosted the Gravity Games, a multi-event extreme-sports competition, in 2005 and was featured in the 2007 video game Tony Hawk’s Proving Ground. Local professional skateboarders such as Chuck Treece (b. 1964), Bam Margera (b. 1979), and Willy Akers (b. 1986) became regulars at this skate park and were photographed and recorded riding there on numerous occasions. As the young people who were once chased out of Love Park by the police became adults, they became activists for the sport they loved. Frustration from the Love Park debate emboldened local skateboarders to organize and lobby for the designation of public space for skateboarding. Josh Nims (b. 1975), a local skateboarder, founded an advocacy group called Franklin’s Paine Skatepark Fund (FPSF) to raise funds for a new park and to advocate the value of skateboarding for American cities that chose to embrace the sport instead of criminalizing it. After ten years of fund-raising, the organization raised enough capital to break ground in 2012 on a new facility, Paine’s Skate Park, at Martin Luther King Jr. Drive and the Benjamin Franklin Parkway near the Schuylkill River Trail and the Philadelphia Museum of Art. With support from many individuals in the local skateboarding community, including Jesse Rendell (b. 1980), a skateboarder turned lawyer and son of Ed Rendell (b. 1944), former mayor of Philadelphia and governor of Pennsylvania, the multimillion dollar project opened in May 2013. Skateboarding also became popular in communities surrounding Philadelphia. In the suburbs, local governments succeeded in establishing partnerships to raise funds, build, and maintain skate parks. The borough of Ambler, Pennsylvania, partnered with local supporters and volunteers to open the Ambler Skatepark in 2011. Patrick Kerr Memorial Skatepark in Abington Township, Pennsylvania, took its name from the leading advocate of the project, who died in 2003. Supporters of this skate park also maintained an educational scholarship fund for young skateboarders from the Abington area. Other popular skate parks could be found throughout South Jersey in Brigantine, Maple Shade Township, Medford, Ocean City, Sea Isle City, West Deptford, and Williamstown. A $750,000 skate park in Ocean City was built in 2015 with $500,000 in Cape May County Open Space funding and $250,000 in city money. The opening of skate parks throughout the region in the twenty-first century coupled with the abundant support of the skateboarding advocacy nonprofit organization Skate Philly, formed by members of the Franklin’s Paine Skatepark Fund to promote the positive aspects of skateboarding in the region, demonstrated the resilience, organization, and dedication of the local skateboarding community. Willy Akers (b. 1986), Wilmington, Del. Tom Asta (b. 1990), Langhorne, Pa.
Chris Cole (b. 1982), Langhorne, Pa.
Kerry Getz (b. 1975), Lehighton, Pa.
Josh Kalis (b. 1976), Philadelphia. Brandon Cole “Bam” Margera (b. 1979), West Chester, Pa.
Chuck Treece (b. 1964), Philadelphia. Ishod Wair (b. 1991), Bordentown, N.J.
Stevie Williams (b. 1979), Philadelphia. Brooke, Michael. The Concrete Wave: The History of Skateboarding. St. Charles, Ill.: Warwick Publishing, 1999. Howell, Ocean. 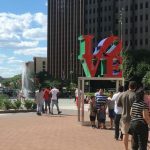 “The ‘Creative Class’ and the Gentrifying City: Skateboarding in Philadelphia’s Love Park.” Journal of Architectural Education. Volume 59, Issue 2 (October 2005): 32-42. Miller, Tom. “Skateparks at a Dead End.” Landscape Architecture. September 2004. Neely-Cohen, Maxwell. “How Philadelphia Destroyed The Greatest Skate Spot Ever Made: The life and death of Love Park.” BuzzFeedNews.com, July 29, 2016. Németh, Jeremy. “Conflict, Exclusion, Relocation: Skateboarding and Public Space.” Journal of Urban Design 11 (October 2006): 297–318. Nevitt, Cindy. “Ocean City Closes New $750,000 Skatepark.” Press of Atlantic City, September 29, 2015. Saffron, Inga. “A Park Where All Are Welcome.” Philadelphia Inquirer, May 17, 2013. FDR Skate Park, Broad and Pattison Avenue, Philadelphia. Franklin’s Paine Skatepark Fund, 2930 Chestnut Street, Philadelphia. Grays Ferry Skatepark, Grays Ferry Crescent Trail. 3600 Grays Ferry Avenue, Philadelphia. 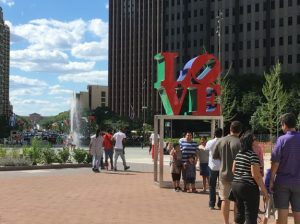 Love Park (John F. Kennedy Plaza), Fifteenth Street and JFK Boulevard, Philadelphia. Granahan Skatepark, 6500 Callowhill Street, Philadelphia. Paine’s Park, Martin Luther King Jr. Drive and Benjamin Franklin Parkway, Philadelphia. Pop’s Skatepark, Trenton Avenue and East Hazzard Streets, Philadelphia. McCreesh Skatepark, 6744 Regent Street, Philadelphia. Rose Playground Skatepark, 1300 N. Seventy-Fifth Street, Philadelphia. Water Tower/Chestnut Hill Skatepark, 200 E. Hartwell Lane, Philadelphia. Whitehall Skatepark, Torresdale Avenue and Wakeling Street, Philadelphia. Ambler Skatepark, South Main Street and Bannockburn Avenue, Ambler, Pa.
Falls Township Skatepark, 9125 Mill Creek Road, Levittown, Pa.
Roslyn Skatepark/Patrick Kerr Memorial Skatepark, Roslyn Park, 2726 Fernwood Avenue, Abington, Pa.
Brigantine Skatepark, 4100 Bayshore Avenue, Brigantine, N.J.
Freedom Park Skate Park, 86 Union Street, Medford, N.J. Maple Shade Skatepark, 430 S. Fellowship Road, Maple Shade Township, N.J.
Monroe Township Skatepark, 700 N. Tuckahoe Road, Williamstown, N.J. Ocean City Skatepark, 550 Asbury Avenue, Ocean City, N.J.
Sea Isle City Skatepark, 5926 Sounds Avenue, Sea Isle City, N.J. Seventh Street Skatepark, 1180 E. Seventh Street, Wilmington, Del. AJ Kohn and Rodney Watkins efforts from running inner city programs over the years (since 90s for Rodney and early 2000’s for AJ) was one of the catalyst to get the 1 million legacy gift from mayor street to get Paines built and land donated. Their students were handed the proverbial check and a photo exists with Mayor Street, Josh Nims, AJ, Rodney and their students during that time.